Here’s a quick “Twist in Translation” I found while studying the faithful and discreet slave (please see the study “Who is the Faithful and Discreet Slave? (A context adventure) for a clear study on the slave). It pretty much explains itself. See the passage below and meet me on the other side. My purpose here is not to talk about whether it’s a sin to have a drink. Most Christians and JWs will agree that Biblically, it’s a sin to get drunk. And a person who gets drunk habbitually is a drunkard. But, what exactly is a “confirmed” drunkard? Does one have to be confirmed a drunkard in order to be guilty of being a drunkard? Here’s my point: The word “confirmed” is not in the Greek. The Kingdom Interlinear confirms this in the screenshot above. None of the English translations insert this word. Why would NWT? 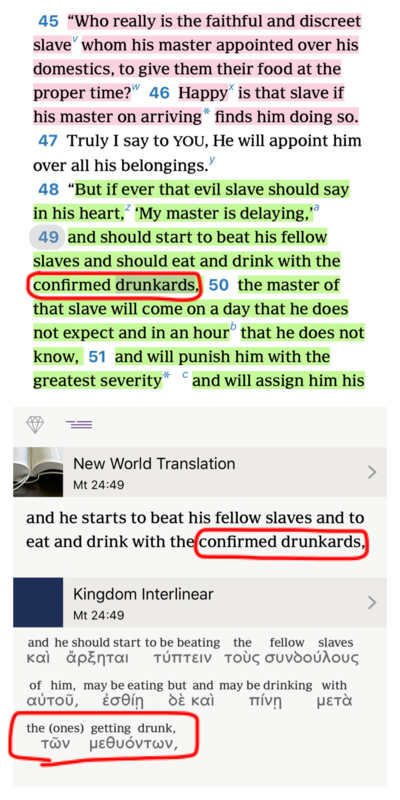 Is it to give leniancy to the “discreet slave” who JWs believe is their governing body whose members have been known to drink? Is it to give room for a certain amount of drunkenness before one is considered a “confirmed drunkard?” Whatever the reason, the NWT has added some reasonable doubt here where none really exists in the verse. Is this ok for a translation which prides itself with it’s accuracy? Next Post Jesus the only direct creation of Jehovah? No, it is NOT okay. Having attended Bible college and seminary, I learned there repeatedly that the whole point of biblical translation is to convey the words of the original documents and their meanings as accurately as possible, no more, and no less, with no exceptions, ever. It may seem nit-picky to outsiders, but adding any words that are not there in the source document is considered misguided and amateurish at best, and unethical and deceptive at worst. If a clarifying word is included in the translation, it should be marked by some means such as italics. In this case, the added word “confirmed” does not serve to clarify, but rather introduces confusion, so they are wrong to do so. The irksome part is that no one admits to being their translator(s), so there’s no accountability on their part, and no way to discuss the issue with whomever did the translating.